USDA published a final rule, on June 7, revising the National Organic Program (NOP) regulations to comply with the Harvey v. Johanns decision and to implement Organic Foods Production Act (OFPA) amendments. As a result of the OFPA amendments, the final rule restores the use of synthetics listed at 7 CFR §205.605(b) in products labeled as "organic." Moreover, the final rule revises 7 CFR §205.606 to clarify that, as of June 9, 2007, nonorganically produced agricultural products may only be used as ingredients in products labeled as "organic" if not commercially available in organic form, and if also listed in that section (including compliance with any specified restrictions). Currently, the listed nonorganically produced agricultural products are cornstarch (native), gums-water extracted only (arabic, guar, locust bean, carob bean), kelp (for use only as a thickener and dietary supplement), lecithin (unbleached) and pectin (high-methosy). In May, FDA received a petition from a group of scientists requesting a regulatory change to make Vitamin D a mandatory nutrient for addition to cereal/grain products. The basis for the request is that the required addition of Vitamin D to cereal/grain products could reduce osteoporosis and colon cancer. New research includes a study conducted by the University of Maryland's Center for Food, Nutrition and Agriculture showing that Vitamin D, which aids in the absorption of calcium, would help enhance bone density if added to bread. Given the current interest in fortifying foods with vitamin D to help reduce osteoporosis and other diseases, USDA has decided to improve methods for testing vitamin D levels in various foods. Then, USDA plans to commence a "market basket" survey to determine the accuracy of Vitamin D fortification in foods including milk, juice, cereal, yogurt, and processed cheese. On July 25, FDA published a final rule revising nutrition values to be used in the voluntary nutrition labeling of raw fruits and vegetables. The final rule is effective on January 1, 2008, but FDA will accept voluntary compliance in the interim. The program, which covers the 20 most frequently consumed raw fruits, vegetables and fish, was established in 1991, and permits voluntary point-of-sale nutrition labeling in lieu of mandatory nutrition labeling (if there is substantial compliance with the voluntary program). FDA revised the nutrition information for the following raw fruits and vegetables - apple, avocado, banana, cantaloupe, honeydew melon, kiwifruit, lemon, nectarine, orange, pear, pineapple, plum, strawberry, tangerine, broccoli, carrot, celery, cucumber, green onion, leaf lettuce, mushroom, onion, radish, and tomato. Importantly, due to the changes in nutrition values, some raw produce items may no longer qualify for the same nutrient content claims as before. The final rule also clarifies trans fat labeling requirements for the voluntary nutrition labeling of raw fruits and vegetables and fish. 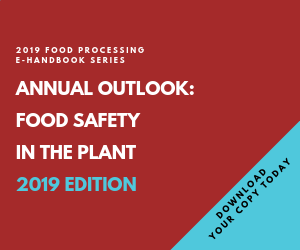 On June 21, FDA issued final guidance to industry: "Recommendations for Early Food Safety Evaluation of New Non-Pesticidal Proteins Produced by New Plant Varieties Intended for Food Use." FDA believes the only concern is the remote possibility that a new protein in food, from a new plant variety, could be an allergen or a toxin. After receiving a safety evaluation with all the elements recommended in the guidance, FDA intends to send a letter regarding its evaluation of the submission (generally within 120 days). FDA emphasized that submission of an early food safety evaluation s not meant to substitute for a biotechnology consultation with FDA about a food derived from a new bioengineered plant variety, prior to commercialization.